AnnieThing for Food: The Cake&Bake Show - Sugarpaste Roses and a Mini Bake Off! 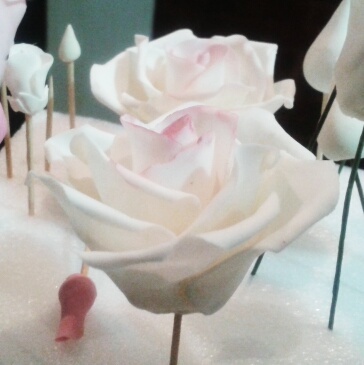 The Cake&Bake Show - Sugarpaste Roses and a Mini Bake Off! 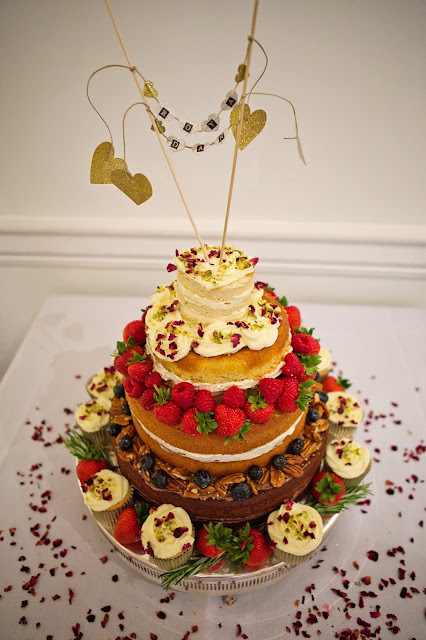 Last year's Cake&Bake Show was a whirlwind of new ideas, inspiration and a virtual stampede to stock up on every single thing I needed for baking cakes. This year's show, although bigger, and yes, I would say, better, was much more relaxed and, I admit, smug. Yes, having a press pass, means, even if you are just a lowly blogger like me, you get to hang out in the Press Room. With the Great British Bake Off contestants. Oh yes. Kimberley and I are now bezzie mates. Of course, not really. I did get to have a really nice chat with Kimberley and Toby (to whom I apologise, I could not remember his name at the time). They were staunch in their confidentiality briefs and could not hint at all at who will win this series. I am confident it will be Kimberley herself. She is every bit as smiley and delightful as she is on the show. Just because I like her and she is a real person (again, an apology to Toby, but he is already out...). 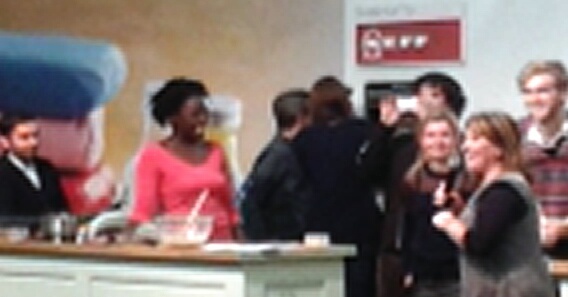 Also mulling around were John Whaite and James Morton from last year's show, and Rosemary Shrager gave me a big smile. My kids loved her in I'm A Celebrity, so that was them impressed when I got home (that, and the Raspberry Fizz handmade chocolates from Artistry in Cocoa). This year I wanted to see as many demonstrations as I could to learn more about techniques, and stalk some more people off the telly. The first demo was Quick and Easy Roses with Kathy Moore of Squires Kitchen. She showed us how simple it is to made a beautiful sugarpaste rose. Sugarpaste is the best icing to use as it is extremely flexible, hardens relatively quickly and keeps its shape beautifully for months. 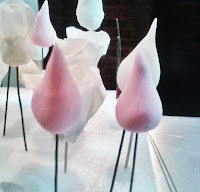 A simple cone shape - using a pretty shade of pink - is allowed to dry, with some wire glued on the base (edible glue, obviously). 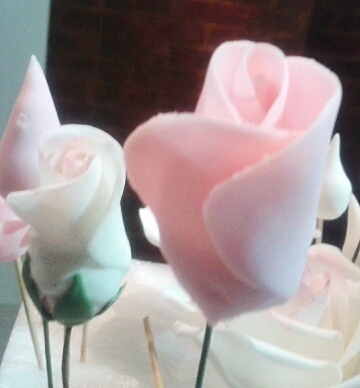 While it is drying, you can add a little white sugarpaste to the same pink colour to lighten it, cut out a five-petal shape using a cutter, gently boff the edges with a dog-bone tool, spread some glue around the centre and slide it up the wire, adhering only the base of the petals to the cone, and over-lapping them in a natural layout. Allow this to dry while you cut out another shape, again lightened, this time with just three petals. Attach in a similar way, and again, allow to dry. A final layer of five with a slightly larger petal cutter, in white, repeat the process, and there you have it. Beautiful, and simple, with a natural colour gradient. 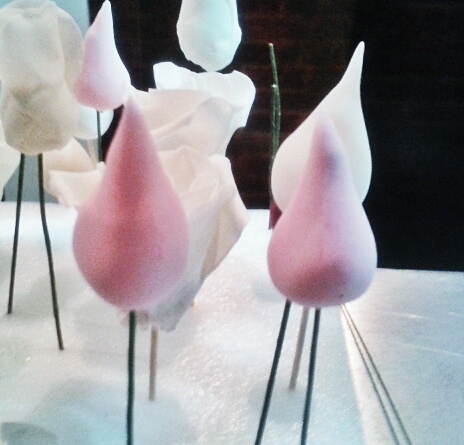 Another class which I would have loved to attend was April Carter's Cake Pop Class. Wrong day though, but you can see how it went on her blog, AND how she was cheeky enough to get a photo with the Bake Off peeps! Next up for me was a live Bake Off between John Whaite and James Morton. Introduced by Wendi Peters, herself a MasterChef finalist, it was fun, more so for me at the beginning when I tweeted that my money was on John. James replied, saying 'Quite right too', but it turns out we were both wrong. I resisted the urge to tweet 'PICK ME!' when they were choosing two audience members, nor did my Hermione-style hand in the air get a look in, but hey, I would have been totally outshone by most of the contestants of this year's show joining James on-stage. They all made almond tuiles, in what seemed like minutes, chatting away about their new books and gossiping about Mary Berry and Paul Hollywood. Bake Off fans heaven. James' tuiles were voted best, at which point John cheekily hopped over to the other side to join in the glory!